Rotor saws, carbide grit rotor saws, circular blades, carbide grit circular blades, saw blades, integral spindle saws. 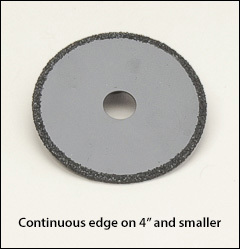 Other circular blades and rotor saws are shown on our Cutting, shaping, grinding tools page. SAFETY WARNING: Make sure the maximum RPM of the blade you choose below, is more than the RPM of the power tool you are using. RPM of power tool cannot exceed (must be less than) maximum RPM of these items. This rotor saws feature long-life sintered tungsten carbide grit, bonded with high strength and high heat resistant binder metal. The width of cut (the thickness of the coated area of this saw) is 1/4". Ideally suited for high speed air or electric tools. 1 3/4" overall length. The carbide grit is a coarse #23 grit. Tungsten carbide grit continuous edge blades for fast cutting, long life, and good finish. Blades cut extremely hard abrasive materials including laminates, fiberglass and composites. Can be installed in any direction and are reversible for extended cutting life. No teeth to break, dull, or chip. Additional sizes and grits are available. 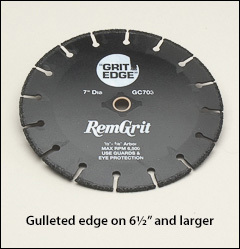 tungsten carbide grit gulleted edge blades for cutting extremely hard abrasive materials including laminates, fiberglass and composites. High heat and abrasion resistance, no teeth to dull or chip. Resists snagging, smooth cutting and great wear resistance.